Making a significant departure from traditional sports motorcycle concepts, BMW proudly presented the “most powerful naked bike of all times” at the 2004 INTERMOT Motorcycle Show: the BMW K 1200 R.
Ever since it has been a well-known fact that BMW is by all means willing and able to openly demonstrate extreme power and extroverted design in genuine style. 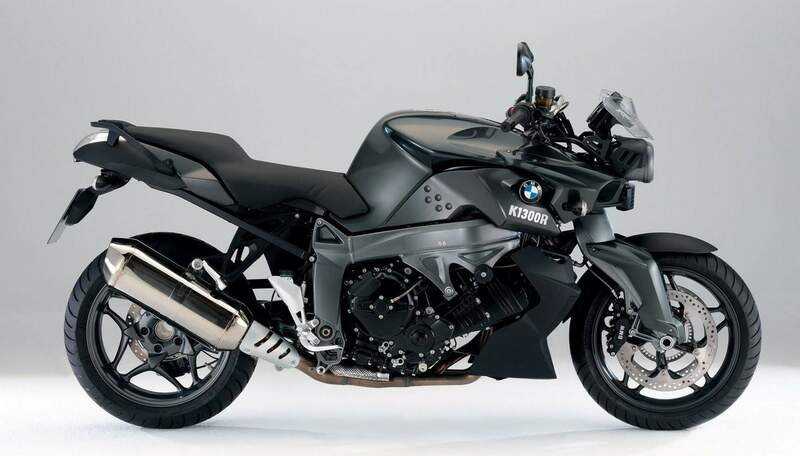 Now the significantly upgraded successor to the BMW K 1200 R is making its world debut at the 2008 INTERMOT Motorcycle Show in the BMW Urban Encounter World – the new K1300R, the most powerful naked bike BMW has ever built. Developing a maximum output of 127 kW (173 hp) and weighing exactly 243 kg (536 lb) with a full tank, this extravagant Power Roadster, one of the most powerful and dynamic machines in its segment, fulfils the greatest demands in terms of riding dynamics without in any way neglecting the particular wishes and preferences of the BMW customer in terms of safety, equipment and riding comfort. The K1300R Power Roadster is a high-performance riding machine offering a perfect blend of performance, riding safety and technical features carried over from the K 1300 S. So while the drivetrain and running gear are carried over from the K 1300 S, they have been modified in this case to meet the particular requirements of a large-capacity naked bike. The most significant and outstanding considerations in developing the K1300R were indeed to offer the rider supreme riding pleasure combined with equally outstanding safety on the road as well as the most sophisticated design features and an extroverted, masculine look. Suspension geometry has been upgraded to an even higher standard than on the previous K 1200 R and it gives the K1300R even greater agility combined with the same high standard of riding stability as before. 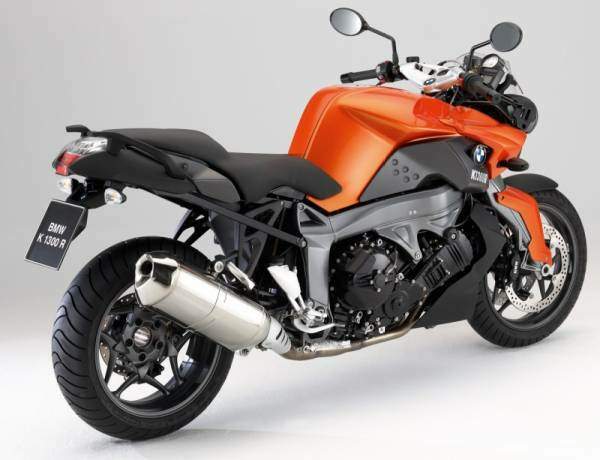 The basic technical data on the suspension are now the same as on the K 1300 S. In comparison with the previous K 1200 R, the BMW Duolever front-wheel suspension is now slightly lower, with the wheelbase of the new model being correspondingly longer. The guide ducts on the engine have likewise been modified for the new machine, with maximum output of 127 kW (173 hp); almost the same as on the K 1300 S. Quite generally, both engine output and torque have been increased significantly over the previous model, while the shorter final drive ratio of 2.91 versus 2.82 on the K 1300 S likewise has a positive impact on the acceleration and pulling power of the new machine. Even more dynamic, particularly at lower and medium engine speeds, thanks to the increase in engine capacity. Engine output 127 kW (173 hp) at 9,250 rpm, maximum torque 140 Newton-meters (103 lb-ft) at 8, 250 rpm. Increase in torque by more than 10 Newton-meters (7.4 lb-ft) all the way from 2,000–8,000 rpm. Newly tuned Digital Motor Electronics to fulfill the highest environmental standards. Optimized charge process for greater performance and lower fuel consumption. Optimized exhaust system with a new rear-end muffl er and electronic flap control as well as a fully controlled three-way catalyst. Desmodromic operation of the power application function to improve dosage of engine power. Even greater riding precision combined with maximum riding stability ensured by the optimized Duolever front wheel suspension with a newly designed longitudinal arm at the bottom. Firmer spring/damper set-up for even better feedback to the rider. Supreme handling ensured by optimized suspension geometry, optimum mass distribution and a perfectly balanced overall concept. Second-generation ESA II electronically adjustable suspension and ASC anti-spin control as an option. New, innovative generation of control switches with optimized ergonomics. Optimized, maintenance-free shaft drive with a new two-stage drive shaft. HP Gearshift Assistant for shifting up without the slightest interruption of power and traction available as an option. Wide range of standard features and accessories tailored to the K1300R, all offering the usual supreme qualities of a BMW. Like the K 1300 S, the new K1300R also benefits from the significant improvement and upgrading of the straight-four power unit, now increased in size from 1,157 to 1,293 cc. Maximum output is now 127 kW (173 hp) at 9,250 rpm, maximum torque is 140 Newton-meters (103 lb-ft) at 8,250 rpm, an increase in power by 7 kW (10 hp) and an increase in torque by 13 Newton-meters (9.6 lb-ft). While the former K 1200 R reached its maximum output at 10,250 rpm, the power unit in the new K1300R develops its maximum power at a significantly lower 9,250 rpm. A further advantage is that more than 70 per cent of the engine’s maximum torque is available from just 3,000 rpm, just as the K1300R offers more than 10 per cent more torque than the K 1200 R all the way from 2,000 to 8,000 rpm. This clearly reflects the objective of the engineers developing the new machine, focusing on even greater driving dynamics with significantly more traction and much better acceleration than on the former model already so successful in the market. ll technical modifications serving to optimize the engine and drivetrain are the same as on the new K 1300 S. The airbox comes with a modified air filter and a newly set-up intake funnel versus the K 1200 R to meet the greater demand of the engine for a smooth and efficient supply of air. And last but not least, the oil cooler with its larger block again reflects the greater power and performance of the engine. Like the K 1300 S, the new K1300R comes with a new rear muffler not only making an important contribution to the machine’s “beefy” torque curve and riding qualities, but also providing an even more powerful sound. This special effect is provided by an electronically controlled exhaust flap, reducing the damper volume with a higher throughput rate. Through its hexagonal design and smaller dimensions, the muffler looks particularly compact and sporting to clearly underline the muscular stance of the K1300R. The K1300R is available with a very light and sporting slip-on muffler made of titanium complete with a carbon trim cover from Akrapović as special equipment. Like the K 1300 S, the K1300R features a new gearshift lever with an ergonomically optimized pivot point. Together with the likewise new anti-friction bearing on the gearshift lever, this ensures an even more precise and faster gearshift particularly when the rider opts for a more sporting and dynamic style of riding. For the first time in the history of series production BMW motorcycles and indeed for the first time worldwide in series production, the rider of the new K1300R is able to shift up without operating the clutch or backing off on the fuel, that is with hardly the slightest interruption of power and traction, by means of the HP Gearshift Assistant available as an optional extra. Introduced for the first time on the BMW HP2 Sport, the HP Gearshift Assistant may be combined with the sport footrests likewise available as special equipment on the new machine. The suspension geometry on the new K1300R has been mod fi ed versus the former configuration in the interest of even greater agility and is now the same as on the K 1300 S.
This improvement is ensured by a different process in machining the wheel carrier and through the Duolever suspension featuring a newly designed longitudinal arm at the bottom with a newly defined pivot point. As a result, the front-wheel guidance angle is now slightly lower and the wheelbase of the new machine has been increased accordingly. The K1300R meets the significant demands made of an unfaired streetbike in terms of sportiness and riding dynamics through the even firmer set-up of the gas-pressure spring strut. BMW’s new ESA II (Electronic Suspension Adjustment II) running gear is available as special equipment at extra cost also on the K1300R. This allows the rider to vary not only the damping effect on the two spring struts and the spring base (spring pre-tension) on the rear spring struts, but also the spring rate and, accordingly, spring hardness conveniently at the touch of a button. Hence, the rider is able to set the running gear very conveniently and more precisely than ever before to his or her specific wishes and the weight the motorcycle is carrying under all riding and load conditions, thus enjoying a new dimension of riding stability combined with optimum response at all times. ESA II is the world’s first system for electronic adjustment of the motorcycle’s suspension offering such a wide range of setting options. The new K1300R comes standard with a 180/55 ZR 17 (K 1300 S: 190/55 ZR 17) rear-wheel tire. As an option, the particularly sporting rider may choose BMW sports wheels from BMW Motorrad’s wide range of optional extras and special equipment, allowing the use of a 190/55 ZR 17 tire. Again in the interest of even better handling and greater performance, this special tire replaces the usual 190/50 ZR 17 tire. The K1300R also comes with BMW Motorrad’s proven EVO brake system featured on other models in the Boxer and K-Series. The brake lines are protected by steel sleeves, brake discs measuring 320 millimeters (12.6") at the front and 265 millimeters (10.4") at the rear to ensure maximum stopping power even from very high speeds and with the motorcycle carrying a heavy load. Further benefits of the EVO brake system are its unparalleled brake pressure build-up rate and the reduction of operating forces to a minimum even when braking all-out – qualities the system has proven in many tests. Indeed, the BMW EVO brake system – EVO stands for evolution – is already renowned in the market as one of the safest and most effective brake technologies available. The new K1300R features a handlebar detached from the frame of the machine in the interest of minimum vibration, a technology carried over from the K 1200 R Sport. The big advantage is the higher standard of everyday riding quality particularly on longer distances. Another new highlight on the K1300R is the brand-new generation of switches and controls. Featuring MID (Moulded Interconnect Device) technology, the new control units are far smaller and more compact and at the same time offer an even higher standard of functionality, clear design and optimum access for easy reach. The new K1300R may be equipped with the HP instrument cluster already well-known from the HP2 Sport as special equipment for the most sporting and dynamic riding requirements, for example on the race track. This superior system developed in cooperation with the German data specialist 2D Systems comes with a large digital display informing the rider in the Road Mode on typical features and data such as road speed, engine speed, mileage covered so far, remaining mileage on the fuel available, and the time spent travelling. During the warm-up phase, in turn, the instruments offer further helpful data. In the Racing Mode the instrument cluster presents data such as lap times, maximum engine speed, road speed, or the number of gearshifts. The HP instrument cluster comes additionally with eight freely programmable LED lights serving, for example to present engine speed or acting as an external gearshift indicator. With its even more muscular design, the new K1300R simply oozes a strong feeling of power and performance at very first sight, standing out clearly from its competitors and leaving behind an impressive visual message through its even more dynamic appearance. The newly designed fairing on the front wheel mount and the compact front wheel mudguard give even greater emphasis to the front end of the K1300R, making it look even sleeker and more dynamic. The aggressively styled radiator trim panels, in turn, demonstrate even more power and performance than before. The intake panel is also new in its design and is now fully painted, supporting the powerful, dynamic look of the K1300R through its almost rough and jagged form. The side covers are even more striking in design, offering even better protection of the rider’s knees from wind and weather through their contoured edges. A modified headlight body as well as new paintwork on the headlight panel, in turn, give the K1300R a new and even more aggressive face at the front. To match this outstanding look, the hydraulic reservoirs fitted on the two halves of the handlebar for the brakes and clutch now come in a discreet smoky glass look. Modified instrument graphics in clear, techno-like layout clearly demonstrate the design of the new machine to the rider himself. The newly designed rear light in LED technology and with a white clear glass look conveys an exciting touch of technical excellence and a superior look of harmony together with the white direction indicator lights. The BMW Comfort seat for the passenger as special equipment. Apart from unparalleled riding pleasure on country roads, the new K1300R offers supreme all-round qualities through its outstanding power unit. And to enhance riding comfort for the pillion rider to an even higher level, BMW Motorrad offers a seat bench much wider and more upholstered at the rear. 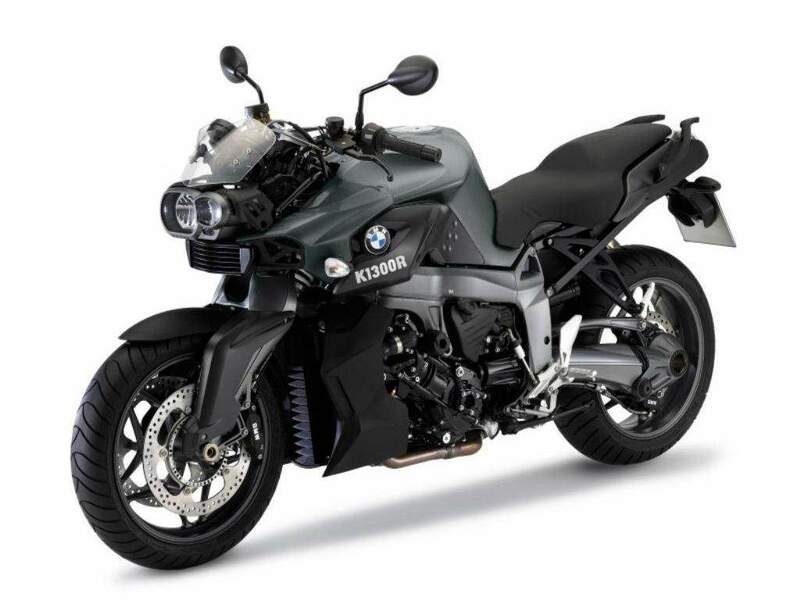 It almost goes without saying that even the very sporting and dynamic K1300R comes with the very best all-round qualities so typical of BMW – also for long distances and tours. The new features boasted by the K1300R also include a special comfort seat for the pillion rider as well as LED direction indicators both front and rear. The usual wide range of options and special equipment from BMW Motorrad serves to further customize this outstanding machine. The particularly sports-minded rider, for example, has the choice of the HP Gearshift Assistant, the HP Info Display as well as carbon trim components as special features on the new K1300R. Optional extras are delivered straight from the factory and integrated during production. Special equipment is fitted by the BMW Motorcycle Dealer either right from the start or at a later point in time, whatever the customer wishes. 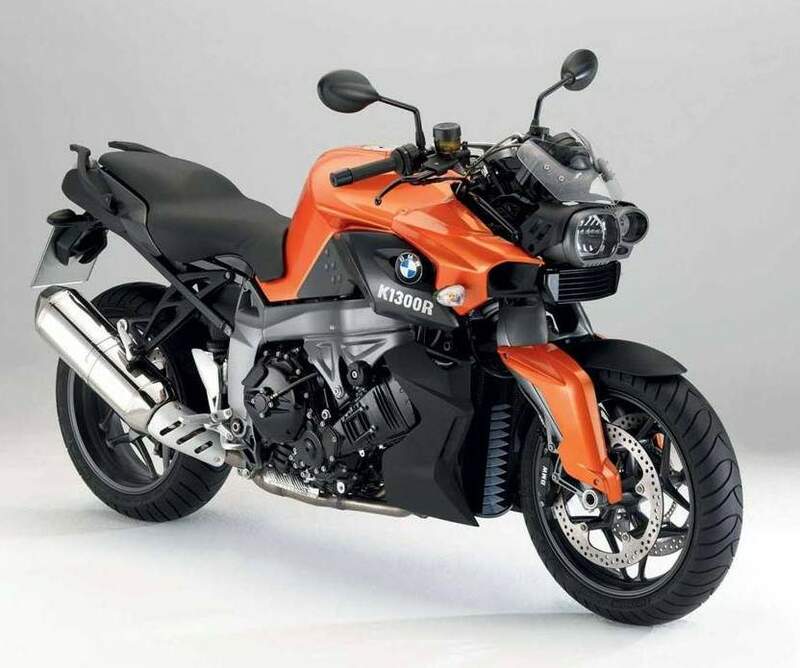 Contrary to the former model, the frame, wheel carriers and drivetrain come in the same color on all three color variants of the K 1300 R. This is because the black engine and suspension components such as the frame and wheel carriers in Asphalt Metallic symbolize the technical character and sporting style of the new K 1300 R.
The body colors highlight the newly designed features and the strong character of the new K 1300 R, in particular the muscular front end and the slender rear. While Silk Metallic stands for masculine strength and determination, Lava Orange Metallic creates a sporting, almost provocative touch. 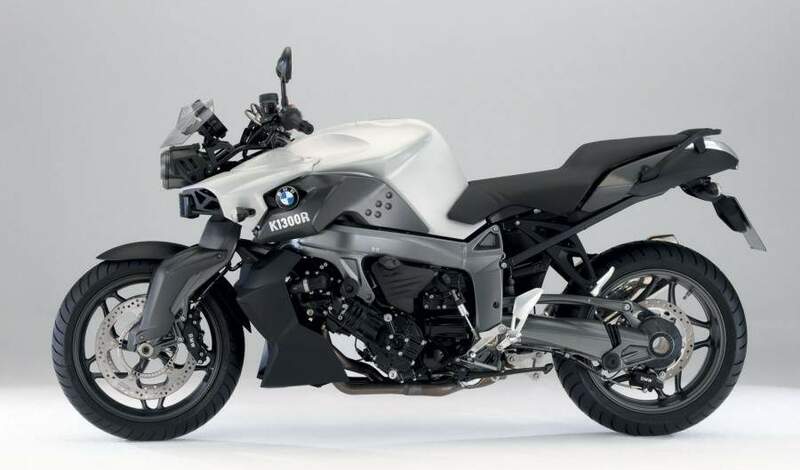 Reflecting the current Zeitgeist, white is now back in the market, nevertheless re-interpreted in this case as Light Grey Metallic with a larger share of metallic components emphasizing the three-dimensional presence of a motorcycle from BMW. The graphically much more aggressive model designation stands out clearly but in full harmony on all color variants. Lower rider’s seat (approx 790 mm/31.1", step arch length 1,750 mm/68.9"). On-board computer including oil level warning. BMW 6.0 x 17" sports wheels on 190/55 ZR 17 tires. LED direction indicators front and rear. Luggage rack with installation kit. Water-tight tank bag including fastening elements. Set of sports cases including case supports. Sports softbag, small, 19 liters /large, 51 liters . Water-tight luggage roll, 53 liters , including fastening belt with tightening lock. On-board toolkit – service kit. Heated handles with switch unit. Low rider seat (approx 790 mm/31.1", step arch length 1,750 mm/68.9"). Sports windshield, tinted, including fastening elements. HP forged wheels, front (3.50 x 17") and rear (6.00 x 17"). HP carbon wheel cover, front. HP carbon clutch top cover (new). HP carbon heat protector for standard muffler (new). Anti-theft warning system with remote control. BMW Motorrad ZUMO navigation and communication unit including support (new).